Hope you are all well! I cannot believe it is the end of the second week already - the time is flying past so quickly. Last weekend I went to Lake Atitlan with Kate and Shana. It was really beautiful and we were staying in a lovely hotel with hot water, clean comfortable beds and lots of scrumptious food! We had our own guide who took us on a boat trip across to Santiago (lots of markets, churches etc). 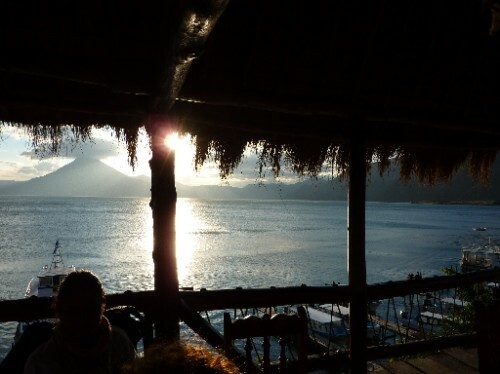 Lake Atitlan is huge, roughly 130 square kms, and used to be ONE super volcano. Today it is surrounded by 3 smaller volcanos. We visited a few of the villages and saw the cotton and weaving process. The boat trip back to Panachejal took 40 minutes and surprisingly the lake gets very rough! We got very wet and thought the roof of the boat was going to come off. It was a bit like being on a rollercoaster and we couldn't stop laughing - although I did end up with 3 bruises on my back afterwards... Later that evening we had a few drinks and watched the sunset over the lake!